180-gram audiophile LP cut direct-to-disc! "...the playing is spirited and unrestrained and the recording superbly transparent and three-dimensional ... for this kind of small, nine person ensemble, I think producer Mike Valentine's "minimalist with some spotlight mike enhancement" approach works really well. ... A superbly produced, engineered, performed and presented edition of the 'Four Seasons'". — Music = 10/11; Sound = 10/11 — Michael Fremer, AnalogPlanet.com. Read the whole review here. A dynamic performance, a pure analog delight! 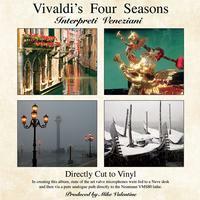 Vivaldi's best known work, The Four Seasons, is given new life in this Audiophile Direct to Disc recording from Chasing the Dragon. In order to make this D2D recording, the Interpreti Veneziani Chamber Orchestra performs each album side live in the studio, recorded via state of the art, all-tube valve microphones, fed to a Neve Desk, and then via a pure analogue path directly to the Neumann VMS80 lathe. The brilliantly captured session was carefully engineered, and mixed live, no overdubs! During the performance, the Neumann VMS 80 Cutting head engages the master lacquer ("stamper" used for pressing LPs) and is not stopped until the entire side is complete! The results are amazing! A more accurate recording, a greater immediacy and interaction among the players, less background noise through the elimination of master tapes, overdubs, etc. by directly cutting the recording to vinyl. A dynamic album that needs to be heard! "Producer Mike Valentine used all-tube microphones, and the sound is as you might expect... String tones were rich and fully expressed, yet the somewhat distantly placed harpsichord had appropriate transient zip and definition." - Michael Fremer, Stereophile Magazine.